More potent formats of monoclonal antibodies (mAbs), such as bispecific antibodies (bsAbs), are on the rise in the area of biotherapeutics. bsAbs recognize two different epitopes. This dual specificity increases the potency of these molecules compared to mAbs and expands the range of possible applications. bsAbs can be used to redirect T cells to tumor cells, block two different signaling pathways simultaneously, dually target different disease mediators, and deliver payloads to targeted sites. At this time, more than 50 bsAb products are currently undergoing clinical evaluation. 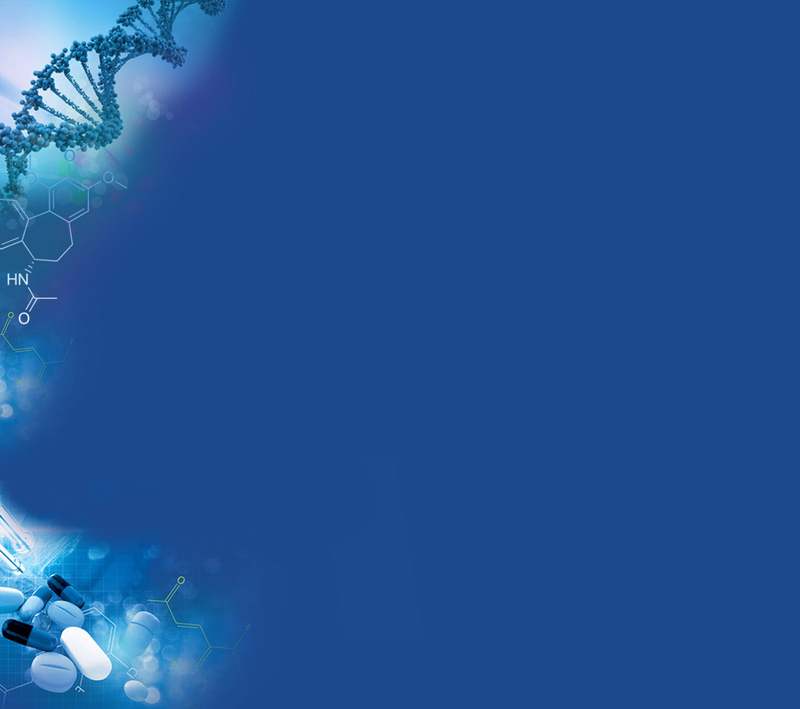 Characterization of bsAbs is essential to ensuring product safety and efficacy. Size exclusion chromatography (SEC) coupled with mass spectrometry (MS) is increasingly being used to identify the accurate molecular mass of biomolecules, including bsAbs. SEC/MS, however, requires the use of mobile phases that do not contain high concentrations of non-volatile salts and the use of columns that do not exhibit particle shedding which will interfere with the MS signal response. 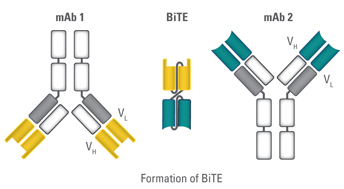 In this application note, a bispecific T cell engager (BiTE®) consisting of two single-chain variable fragments (scFvs) recombinantly linked by a nonimmunogenic five-amino-acid chain (Figure 1) was analyzed by SEC/MS using a TSKgel® UP-SW3000, 2 μm column. 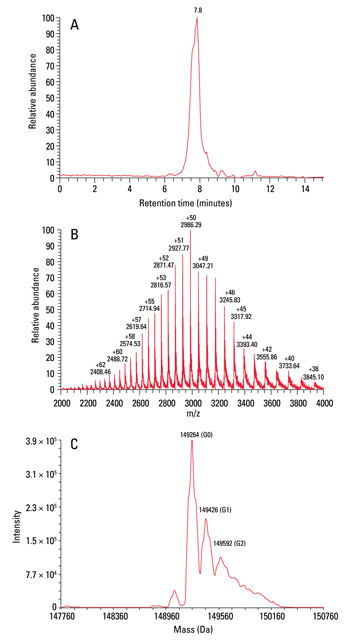 The ~55 kDa BiTE and ~150 kDa parent mAbs were subsequently injected onto a TSKgel UP-SW3000 column coupled to a Q Exactive Plus mass spectrometer for molar mass determination. Figure 2 shows the (a) total ion chromatogram, (b) mass spectrum and (c) deconvoluted mass spectrum of the BiTE. A main peak can be seen at m/z 54,143; adjacent peaks at m/z 54,181, 54,219 and 54,086 correspond to different salt adducts. Figure 3 shows the (a) total ion chromatogram, (b) mass spectrum and (c) deconvoluted mass spectrum of one of the parent mAbs. A main peak can be seen at m/z 149,264; adjacent peaks at m/z 149,426 and 149,592 correspond to different glycoforms. Similar results (not shown) were reproduced for the other parent mAb. 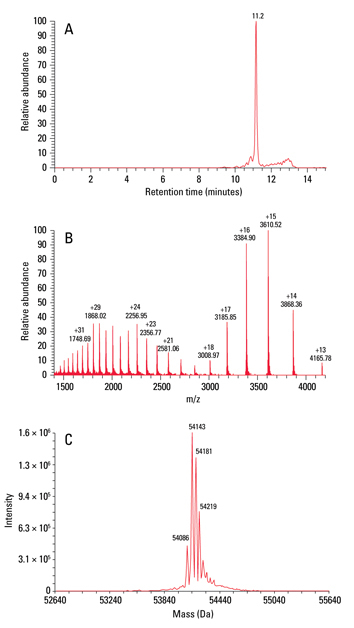 These results demonstrate accurate molar mass determination for the BiTE and both parent mAbs utilizing a 20 mmol/L ammonium acetate, 10 mmol/L ammonium bicarbonate (pH 7.2) mobile phase with SEC/MS compatibility. Prior to analysis, a blank injection was run in order to assess column particle shedding. Figure 4a shows the total ion chromatogram of a blank injection that was run on a new TSKgel UP-SW3000 column. MS data indicates that there is no shedding from the TSKgel UP-SW3000 column prior to sample injection. Additionally, a blank injection was run between each of the sample injections in order to monitor sample carryover. Figure 4b shows the total ion chromatogram of a blank injection run between the BiTE and parent mAb. No evidence of carryover can be seen in the run after sample injection. The lack of shedding and carryover indicate that the TSKgel UP-SW3000 column is suitable for use with MS. The TSKgel UP-SW3000, 2 μm SEC column can be used as a platform method for bispecific antibody accurate mass determination using SEC/MS. A MS compatible mobile phase under non-denaturing condition was successfully used with the TSKgel UP-SW3000 column. No signs of particle shedding or sample carryover, which may interfere with MS signal response, were noted with the TSKgel UP-SW3000 column. TSKgel and Tosoh Bioscience are registered trademarks of Tosoh Corporation BiTE is a registered trademark of Amgen Inc.
Nexera is a registered trademark of Shimadzu Corporation Q Exactive is a trademark of Thermo Fisher Scientific Inc.